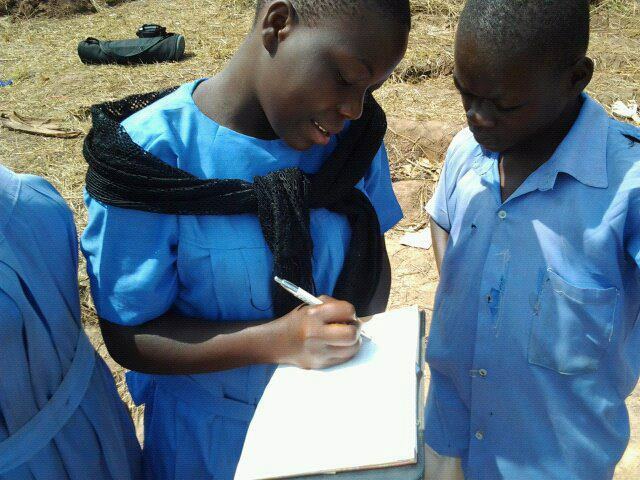 The borehole project will serve a rural Ugandan school, St. Bonaventure, where about half of the children are orphaned. 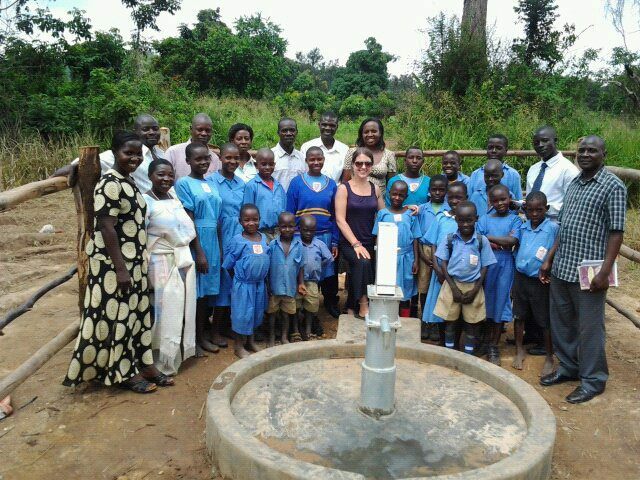 The parish community visiting on Sundays, teachers, staff and families will also benefit from the borehole on school grounds. We taught water, hygiene and sanitation classes and had the students learn how to properly clean jerrycans, keep the borehole sanitary and protect it from contamination. We talked about personal hygiene and hyration as well. The water committee, head master and priests will ensure the ongoing leadership and training of the water user committee. 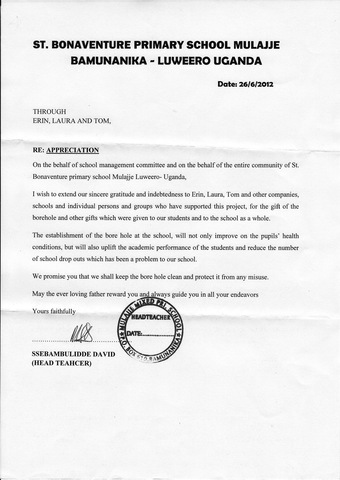 The borehole maintenance funding will be maintained by funds from the school via the priests. We attempted to highly suggest a small user fee to maintain the borehole, but the community simply, does not have the means to pay for water; especially when many students are orphans and the community is very rural and poor. Besides funding the project in time for travels between rainy seasons, there were small misunderstandings (note really "issues") due to cultural and language barriers, but the project was mostly seamless. One of the most difficult things to leave behind was the children still using jerrycans. Even though we do our part to train and engrain sanitary habits of cleaning jerrycans regularly, people cannot do so efficiently or effectively. That is one reason we have decided to design phase three of a gravity fed tap system for late 2013 to rid students and the community of the disease ridden plastic and bring unlimited, safe tap water directly to the school. We dislike like jerrycans; we are bringing a gravity-fed tap system to the school this year, 2013. Without proper soap and hot water, it's impossible to keep jerrycans truly sanitary and REALLY have the access to safe water one needs to do everything (grow food, complete chores, wash the self, brush teeth and hydrate). Total people impacted include the fluctuating 500-700 children at St Bonaventure Primary School, it's next door high school, St Charles, and the non-orphaned student family members, priests, visitors and church goers who irregularly gain exposure to this new water source. Almost half of the students at St Bonaventure are orphaned and about 100 of then live on the floors of a worn down building "the dormitories" on site. The two nearest previous public sources would sometimes dry up, there were lines to wait for water, girls were going into the bush with men, and the public sources were not sanitary. The children are in primary school grades k-7 (baby class through P7). Sometimes the high school students visit the school as well and may do so even more with safe water coming into gravity fed taps in phase 3 in late 2013. Implementer: Drink Local. Drink Tap., Inc.